(R-L) Director AMREC, Prof. Carolyn Afolami delivering her speech at the Training with the DVC, Development, Prof. Segun Lagoke, Director IFSERAR, Prof. Segun Osinowo and Director SIWES, Prof. M.O Ajala listen with rapt attention. The Vice-Chancellor, Professor Oluwafemi Olaiya Balogun, has called for the recognition of soybean as a major industrial and food crop, with invaluable potentials of alleviating poverty. Professor Balogun who was represented by the Deputy Vice-Chancellor (Development), Professor Segun Lagoke, made this disclosure at the On-Campus Capacity-Building programme on Soybean Production for farmers, organized by the University through its extension delivery outfit, the Agricultural Media Resources and Extension Centre (AMREC). 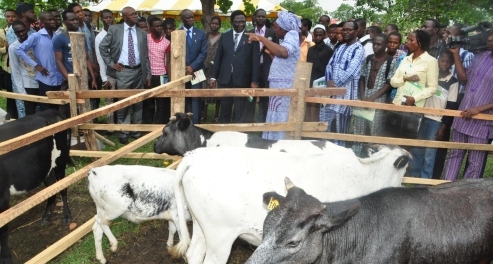 In his speech, the Vice-Chancellor said “this year’s training on Soybean popularization will further strengthen the knowledge of our farmers on Soybean Production”, noting that Soybean is suitable for cultivation on Nigeria soils, with the nation noted as Africa’s largest producer of Soybean and Soy products. Professor Balogun said the recent increase in demands for Soybean among poultry producers, vegetable oil Industries and other baby/infant formula producing industries has boosted demand for Soybean grains in Nigeria. The Vice-Chancellor noted with dismay the shortfall in Soybean supply which he attributed to the decline in the general assistance to agriculture and agricultural extension services over the last few decades. He, therefore, expressed sincere appreciation to the Management of NESTLE Nigeria Plc. for collaborating with the University to improve the extension service delivery on Soybean production to Southwest Nigerian farmers. In her address, the Director of AMREC, Professor Carolyn Afolami, said the programme was meant to increase public awareness on the socio-economic importance of soybeans, share experiences, unveil results of the past years of research and development and to address jointly as stakeholders in the project, some of the challenges and constraints associated with production, processing and utilization of the crop. The AMREC Director, said parts of the objectives of the training were to improve Soybean agronomic practices, post-harvest handling and storage as well as to keep farmers abreast of information on the economic potentials of Soybean cultivation. The Workshop had representatives from various farm communities in Ogun State with the President of the Rice Farmers Association in Ogun State, Pastor Adenekan in attendance.